Flaherty Fardo, LLC are experienced bus accident attorneys who have successfully litigated numerous cases against both public and private busing companies. Bus accident cases can be different than other motor vehicle accident cases because of the urgency in preventing evidence (typically video) from being destroyed. You need to act immediately when you or a loved one has been a victim of a busing accident. If you do not, you risk losing key evidence about your case. Buses are categorized as commercial vehicles and therefore the regulations set forth concerning tractor-trailers also apply to commercial buses and school buses. Our firm has had great success in litigating and settling cases against busing companies, and especially the Port Authority of Allegheny County, Pennsylvania. Both partners Attorney Shawn T. Flaherty and Attorney Noah Paul Fardo have obtained jury verdicts against The Port Authority of Allegheny County. Bus companies are a unique defendant and the Port Authority of Allegheny County will vigorously defend claims. If you have been injured by a Port Authority bus, you need experienced trial lawyers who have litigated cases previously against them. The Port Authority has already lost cases to our law firm involving discrimination of handicapped passengers and accidents involving pedestrians. This does not guarantee success, but does confirm our experience in winning claims against them. When we sued them under the American with Disabilities Act (ADA), for violating the civil rights of a handicapped passenger, the Port Authority fought the case for several years and filed several appeals. In the end, they lost all of their appeals, and were ordered to pay all of our attorney fees. This verdict by partner Noah Paul Fardo, Esq. was the first time the Port Authority of Allegheny County was ever proven to have intentionally discriminated against a handicapped passenger. The verdict received attention from lawyers nationwide and hopefully changed how the Port Authority treats handicapped passengers. 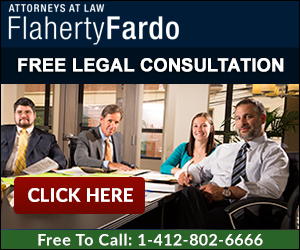 If you have any questions about wrongful death lawsuits, Flaherty Fardo offers free consultations. Consults can be done on-line or by calling our offices at 412.802.6666. Our representation for all Pennsylvania wrongful death and survival action cases is based on a contingent fee structure. There is absolutely no fee unless we obtain monetary recovery. We advance 100% the costs, including experts, filings, and depositions and are only reimbursed from the client’s share if we are successful.